"I'm not the first one, I will not be the last one". The Maronite Patriarch, Card. Beshara Raï, this week inaugurated the Church of St. John the Evangelist, within the convent of St. Savior of the Lebanese Missionary order (Oml-Ghosta-Kesrouan). 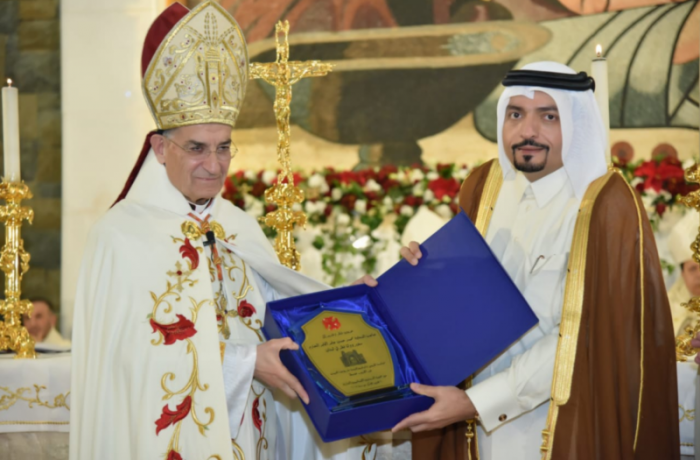 The ceremony took place in the presence of the Qatari ambassador to Lebanon, Mohammad Hassan Jaber al-Jaber, as special representative of the Emir of Qatar Tamim ben Hamad al-Thani, who personally financed the construction of the place of worship. The church is located in the Kesrouan, one of the administrative divisions of Mount Lebanon, in the center of the country. It is the first of a series of projects covering a total area of ​​1700 square meters and also includes two other blocks that include a convent, a library, a sports center, underground parking, rooms, an amphitheater, lounges, bars and kitchen. Speaking at the inauguration, the ambassador of Qatar stressed the importance of Islamic-Christian dialogue, of which the emir has been "a fervent supporter" for decades. He then recalled the construction of churches in the Gulf country and the over 200 thousand Christians living in Doha. Finally, the diplomat assured that despite the serious diplomatic and institutional crisis with Riyadh, the country will remain faithful to the commitments made and the economic investments signed. If, on the one hand, there is a visible attempt in Lebanon to boost the encounter between Christians and Islam, there is also evidence of an increase in intolerance following teh violent onine verbal abuse of a Muslim deputy, "guilty" of having participated in a mass and receiving the blessing from priest. Sunni parliamentarian Roula Tabch Jaroud, exponent of the Future Movement attended the New Year's function in the church of Sant'Elia in Antélias. At the end of the Mass "of peace and charity", the deputy presented herself to the priest who placed the ciborium, containing the consecrated hosts, on her head in a sign of blessing . A gesture of peace, fraternity and dialogue according to some; a serious violation of the precepts of Islam and a gesture that denies faith for many others, which have fueled a ferocious online campaign. The controversy continued and yesterday's visit to the center of Dar el-Fatwa was worthless, where the parliamentarian confirmed her loyalty to Islam while recognizing her "openness to others". "There is no justification - wrote an internet user on Twitter - the deputy Roula Tabch Jaroud has to resign". People like her, another adds, should not "represent" Muslims. The woman responded immediatley with strong words in defence of her the choice to participate in the mass. "I am not the first Muslim to enter a church - she said - and I will not be the last one".